The inspiration for this dish comes from a recent trip to St. Augustine. The hotel we stayed at has a complimentary happy hour on Friday night. The chefs from the Italian restaurant prepare an appetizer and the bartenders make a signature cocktail for the event. This particular time, the appetizer was a cheese ravioli topped with a pesto alfredo. I absolutely loved it. It had just enough pesto with out being too much. I knew I wanted to use those flavors in a dish at home and decided to add some grilled chicken and make a meal of it. This was absolutely delicious! The chicken had great flavor and we both loved the pasta sauce. This dish is easy enough to make during the week. I used a jar of Trader Joe's Alfredo sauce and Trader Joe's prepared pesto. I cooked the pasta and made the sauce while Chicken Legs grilled the chicken. Dinner was ready in about 15 minutes! Combine Italian dressing and 1/4 cup pesto. Pour over chicken and marinate 1 hour to overnight. Grill chicken until done. Let chicken rest for 5 minutes and then slice. Cook pasta according to directions on package. Drain, set aside. In a large saucepan, combine Alfredo sauce and 1/4 cup pesto. Cook over medium-high heat until heated through. Toss pasta with sauce. Divide pasta between 4 pasta bowls. 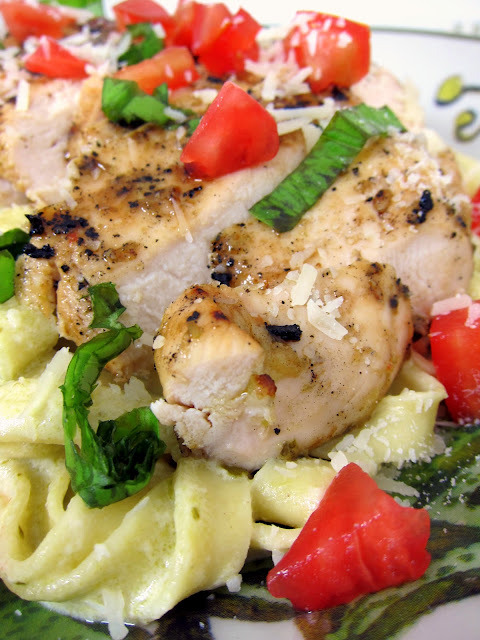 Top pasta with sliced chicken, parmesan cheese, tomatoes and fresh basil. Mouthwatering recipe! I have got everything in my fridge to try this, before going to my holidays! Thanx!!! Stop this right now Stephanie! I'm already hungry for dinner and it's only 8:45 am! Nifty! 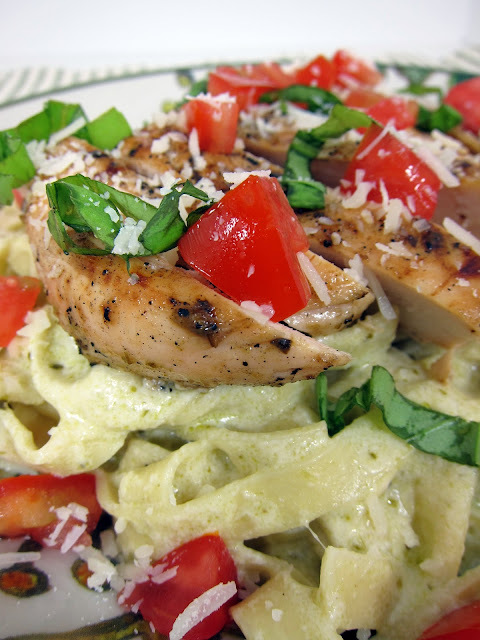 I'm going to try it in the crockpot rather than grilling it - like salsa chicken with alfredo pesto! A quick and tasty sounding meal. And Trader Joes just opened their first store in Knoxvlle last week, perfect timing. I made this for dinner tonight and it was delicious! Thanks so much! Hope you're having a nice week. I've posted the new Homemaking Party for the week and would love to have you link up, if you'd like!